“We had everything! We ain’t have to leave this community for nothing!”, he said proudly of his neighborhood: Oldtown in East Baltimore. I stood behind the camera conducting an interview with my Youth Leader coworker for our Youth Unlocked Summer 2014 film project. In front of the camera he stood, enthusiastically pissed. His body language was eager to tell us the story of the community where he grew up, and where he still lives. 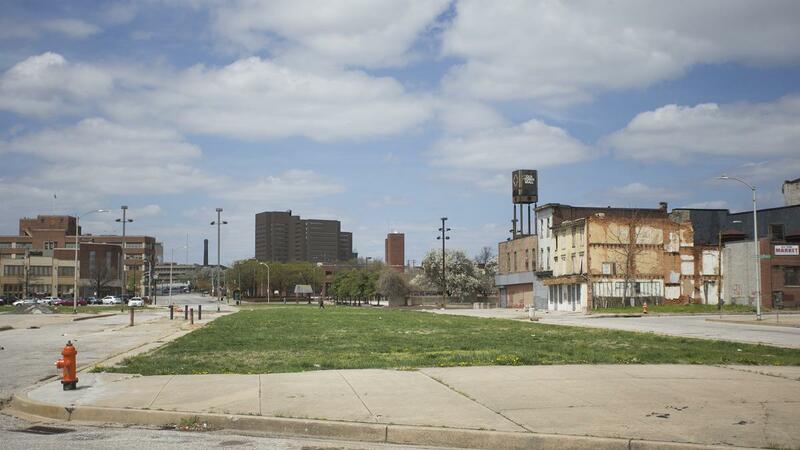 His face was stressed – enraged at the city that had abandoned this former staple of Baltimore. I understood his frustration. I knew what people thought of Oldtown. I knew community residents were and still are being pushed out. Police occupy the streets while trash scatters across them. Drug dealers take up the formerly popular mall – now in shambles. Johns Hopkins is buying up space like the community is a penny store. I share the anger because I know that Oldtown is not the only formerly great community now labeled as “ghetto“ and “hood”. A common impression is that the Black residents who live in this neighborhood are solely responsible for making it into a present day wasteland. We make assumptions that these communities were forever destined to be this way. These assumptions are flat out wrong. The grounds of what use to be Belair Market. The assumptions we make may ignite our curiosity to seek and learn. But when we state — and believe — our own assumptions as facts we often end up ignoring the truth. Recently, city residents were quick to run to Baltimore’s defense while national and international media made assumptions about our city. People highlighted their truths about Baltimore. This film project was produced to share the real story of what happened to Oldtown and to open the possibility for a future that does not equal the past. Watch the film below to take a look at Oldtown’s past, present and aspiration for a future.